Directly out of the Bluezone Corporation studios, Skynet Prototype - Military Robot Sound Effects is an amazing new sound effect library providing editors and sound designers with new and innovative ideas for their challenging and creative projects. This sample pack offers extensive possibilities with no less than 209 wav files ( 900 MB Data ) covering a wide range of sounds including chain tracks, impacts, machine gun bursts, radio transmissions and much more. This professional sound library has been created with high quality recordings and treated using complex synthesis techniques. A huge choice of designed sounds are loaded in this sound bank : beeps, cartridge case ejections, chain loops, mechanical elements, communication parasites, synthetic motor chains with pitch up and down variations, weapon firing sounds and lots more. 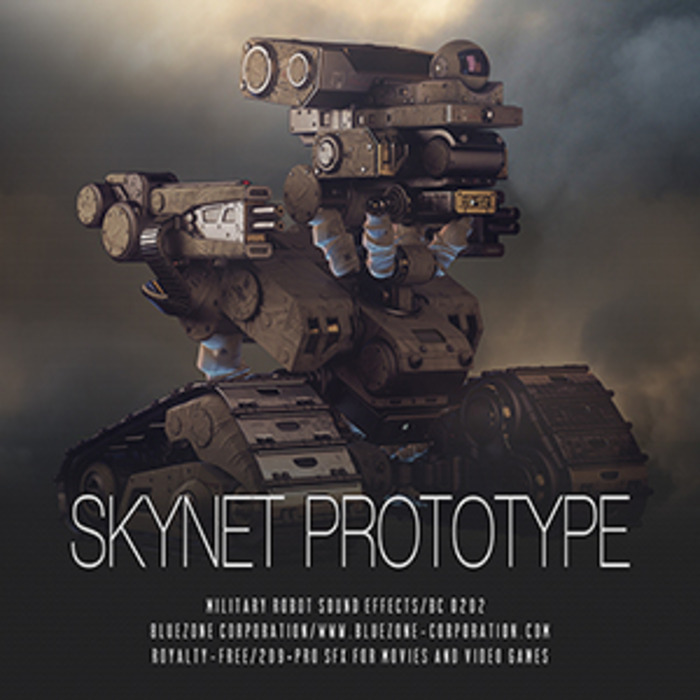 Skynet Prototype is ideal for TV sound design, multimedia, movie and video game audio projects. Like all Bluezone sample libraries, this pack is royalty-free and does not require any additional costs or permissions - it's 100% ready to be used in your commercial productions.